Hailed by Plato as the “Tenth Muse” of ancient Greek poetry, Sappho is inarguably antiquity’s greatest lyric poet. Born over 2,600 years ago on the Greek island of Lesbos, and writing amorously of women and men alike, she is the namesake lesbian. What’s left of her writing, and what we know of her, is fragmentary. Shrouded in mystery, she is nonetheless repeatedly translated and discussed – no, appropriated – by all. Sappho has most recently undergone a variety of treatments by agenda-driven scholars and so-called poet-translators with little or no knowledge of Greek. Classicist-translator Jeffrey Duban debunks the postmodernist scholarship by which Sappho is interpreted today and offers translations reflecting the charm and elegant simplicity of the originals. 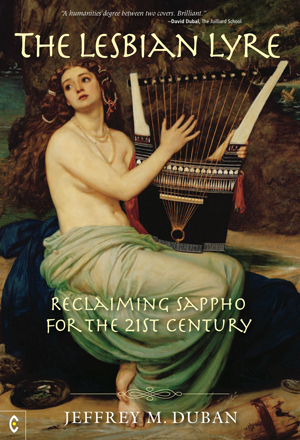 Duban provides a reader-friendly overview of Sappho’s times and themes, exploring her eroticism and Greek homosexuality overall. He introduces us to Sappho’s highly cultured island home, to its lyre-accompanied musical legends, and to the fabled beauty of Lesbian women. Not least, he emphasizes the proximity of Lesbos to Troy, making the translation and enjoyment of Homer’s Iliad and Odyssey a further focus. More than anything else, argues Duban, it is free verse and its rampant legacy – and no two persons more than Walt Whitman and Ezra Pound – that bear responsibility for the ruin of today’s classics in translation, to say nothing of poetry in the twentieth century. Beyond matters of reflection for classicists, Duban provides a far-ranging beginner’s guide to classical literature, with forays into Spenser and Milton, and into the colonial impulse of Virgil, Spenser, and the West at large. JEFFREY DUBAN attended the Boston Public Latin School, beginning his study of Latin in the seventh grade and Greek in the tenth. As a Classics major at Brown, he also studied Old Testament, Sanskrit, and Classics at the Hebrew University of Jerusalem. He obtained his Ph.D. from Johns Hopkins and briefly entered upon university teaching, later earning his JD from Fordham. As an attorney, he specialized in academic law. The Lesbian Lyre is the inspiration for the author’s program, in which he serves as narrator, of Sir Granville Bantock’s Sappho: Nine Fragments for Contralto (see www.thelesbianlyre.com for further information).